This last weekend was big news in Wildstar because the beta weekend showcased the first release candidate patch. Clock’s ticking, and May 31, the pre-order head start is not that far away anyway. The patch notes were quite extensive, no kidding. I don’t play much during beta weekends anymore, because spoilers and all that, but I did manage some hours to test all the things that I picked up in the patch notes. Character Creation now offers various body types for all races and genders. That one was a shocker, because there had been no previous indicator that this would be a possibility. I think a lot of people were excited about that. Syl from MMO Gypsy posted a video in her Youtube channel to show all the character creation options, including the few new hairstyles. I tested a bit as well, and was torn between disappointment and satisfaction. The original problem, the tiniest waists in the world, still exists. There is no slider that lets you fiddle with the body type until it’s perfect. There are 9 preset options and those presets mostly either deflate or blow up specific body areas. This should make dudes who want big bouncy breasts really happy. If only they let you adjust the waistlines, I would be happy too. I think in general I will be able to create a female character I find adequate more so than before. Biggest improvement of all the races are the granok ladies. You can finally adjust them to have a realistic big body type that doesn’t seem ridiculously unmatched. At least the hips now match the breasts. You don’t want to know what they looked like before. The new UI definitely looks a lot slicker than the previous incarnation. Bar layouts are much nicer, and menus and other UI elements just look a lot cooler now. Of course, said look broke a lot of things. For example, all dialogue boxes for taxi rides were broken and only displayed the Yes and No buttons, with no other text, which managed to get one of my characters sent back to the first zone on Nexus. There was a lot of running back involved. Quest NPCs got much bigger boxes to read quest text which I thought was a large improvement. Unfortunately those improved boxes were shaking on my screen all the time, and they also got pushed up a few pixels every time, which eventually meant that the text disappeared off-screen. Whoops. Then there were tutorial boxes that just wouldn’t go away until you did /reloadui. Yes, there were problems. A look at the UI. Pretty much laid out like I would do it in WoW. 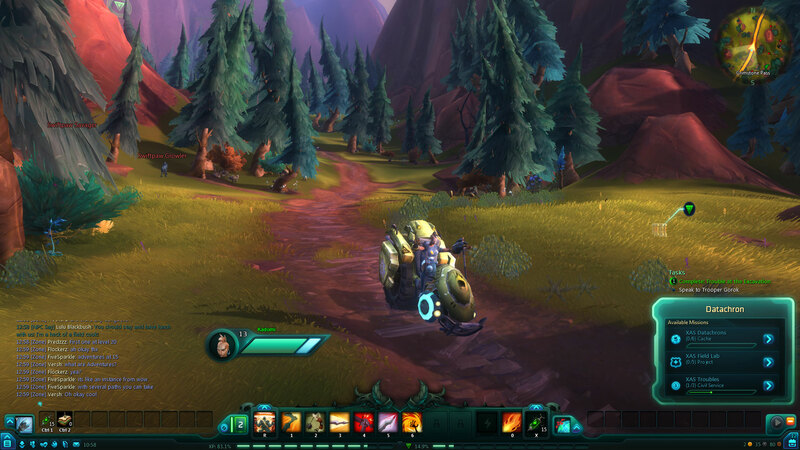 Also, Wildstar motorbikes are coooool. I forgot to take a screenshot during combat to show you what the new resource bar looks like. This German MMO site has a great overview of the new UI features and the different resource bars. A short summary: in combat, each class has a slick looking new indicator for the class-specific resource. In the case of my warrior the dark frame in the center of the hotbar gets a red skull that gets more brightly red and aggressive the more kinetic energy you have. A look at the warrior resource bar. All in all I think the new UI is a big improvement, and the bugs should hopefully be easy fixes. In my class overview, I had described that I thought the Spellslinger is problematic, and that it would be interesting to watch Carbine fixing the class. I think they did an admirable job, because the spellslinger I rolled was so much fun that I am shaken up in the selection of my main again. Definitely liking the spellslinger better than the esper now. What changed? Not much, really. The Spell Surge Innate is still pretty much mandatory to always be on. However, the very slow in-combat regeneration of spell power was fixed and now has the same rate as out of combat. This makes it possible to have Spell Surge active for most casts, and provides much needed burst. I did a couple 2+ quests, and felt that the Innate was a fun micro-management now, instead of a frustrating resource. I don’t know if they tweaked the other numbers of Spellslinger abilities. Charged Shot delivered quite impressive crits. I then spent the rest of the weekend on my warrior. Still remains my least favorite class though it grows on me. I will miss my mohawk granok lady a bit. Warriors got a few fixes, the most obvious one the new animations and sound of Power Strike. I lamented the really annoying Power Strike sound before. Unfortunately the new Power Strike sound still sounds like you are tickling something with a feather. It is however absolutely not annoying anymore which is a big plus, and it got amazing character animations to go along with it. Warriors look awesome when they use Power Strike. Well done, animation team. The biggest announcement in the patch notes regarding gameplay changes was the change for stun breakout gameplay. Many mobs but also other players have stun mechanisms. On mobs it usually means that a huge, severely damaging telegraph attack is incoming. In the past, you now had to spam F frantically to break the stun before you had to eat the damage. I play with a G13 keyboard, and the spamming didn’t really work out at all for me. The new mechanism is that it will announce a random directional key from WASD that you need to hold for a certain amount of time to break the stun. It did work better for me but it’s still a bit buggy. Key presses or in my case stick movement (the G13 has a directional thumbstick I use to move) didn’t register, and so you were unable to break the stun in time. Again, I think that’s something that the devs should hopefully be able to fix with an upcoming build. Overall, I think all of the changes that I have mentioned show that Carbine is listening to player feedback and providing fixes. I think that’s a great plus because there are MMOs out there with lacking communication, e.g. SWTOR. I think if they keep it up, Wildstar will be on a great road to possible success. I am so done with beta weekends though. I know they’re important, especially in light of all the bugs that are still in the game. I want to play though. I am ready to stop skimming in efforts not to spoil myself and explore Nexus to its fullest. The secret to a “girl” chua, I have found, is to avoid facial hair and create facial features that are traditionally associated with females, or at least cartoon females. Obviously, avoid the faces that are ugly. If you make the eyes larger and further apart while making the mouth and jaw smaller, it creates the illusion. Add some hair, and pink is unnecessary! I purposely tried it with not-pink and not the face used on the “girl” chua in the promo pictures, and it seemed to work. I am seeing if I can get away with a hairdo that is not the “girl ponytail” and still have the chua girl…ish. I still think there will be many pink chuas. I just wish you could change height. I prefer shorter characters that take up less screen, but would love for a mini-Granok type – same body type, just a couple feet shorter. Are you playing Exiles at the moment? I am focusing on Exiles in the beta at the moment, because I will go Dominion at launch. I wish character creation was more like Rift where you had a lot of options for body type and height, more so than any other MMO that I recall. I love the new breakout mechanic. You still have to react quickly, but its better than spamming a button and it seems easier to then get out of a harmful telegraph. Yeah, I agree. Just a bit perplexed it’s the strafing buttons as well. It’s a good change and I am glad they did it. Wish they removed the other F-spam elements in quests in a similar fashion.